Cwmduad is a small friendly village situated between Carmarthen and Newcastle Emlyn in the heart of the beatiful Teify Valley. Attractions in the area working Woollen Mills, Toy Museum, Castles and Maricets. 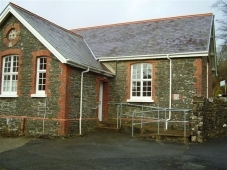 The Cwmduad Community Centre was the old village school and purchased by the village some years ago to be used as our Local Community Centre. It is run voluntarily by a committee who try to hold social and fund raising events throughout the year. The Hall is licensed for Alcohol, Music and Dancing. There are tables and chairs to accommodate up to 50 people. Kitchen with oven, Hob Microwave, Crockery, Glasses and Cutlery. The hall benefits from underfloor heating. There are two rooms, The large hall Measures 28'6" x 21'6" and the small room 16' x 14'. The small room has a good number of powerpoints. The Village of Cwmduad is approx 10 miles North West from carmarthen A484. The main road from carmarthen to cardigan. The hall is situated oppostie the village pub the Afon Duad just off the main road.